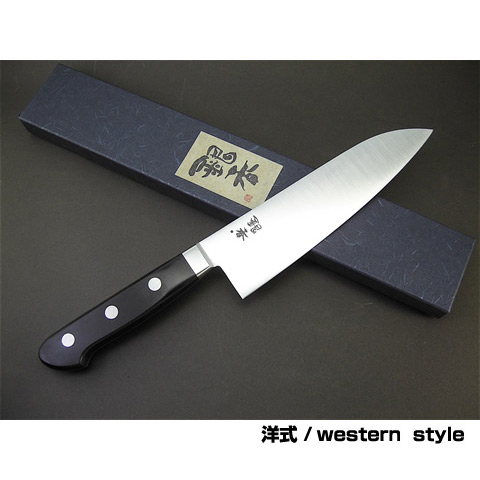 This is the santoku utility knife, shaped for home cooking, of our original brand "Ginga". 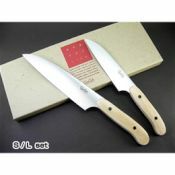 "Santoku" means "kitchen application of fish, meat and vegetables". 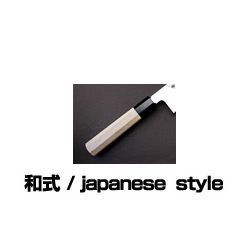 In other words, it is a multi-purpose knife for home kitchen! It is a modified type of knife for Japanese foods which is thinner than meat knife. The famous Sweden stainless steel for cutlery is used as raw-materials, and with the appropriate heat processing the knife is tempered to a perfect balance of optimum edge retention (Rockwell hardness 58 degrees). Our skillful craftsmen polish each knife one by one by hand carefully. You can enjoy its perfection in various applications. Certainly, we also provide carbon steel as an alternative. The handle is made of an anti-bacterial layered plywood. It is very hygienic and in good weight balance. You can use this knife for prolonged periods of time with no fatigue. We provide an engraving service for name or initial. 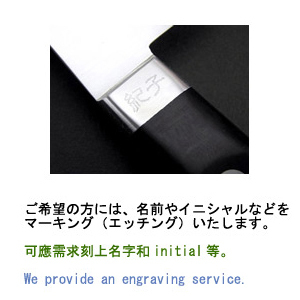 •If you wish to utilize the engraving service,​ please inform us of the name you'd like to have engraved by email. •This item may take more than 2-month before shipping can occur. We appreciate your understanding.